To devote your life to the good of all and to the happiness of all is religion. Whatever you do for your own sake is not religion. Swami Vivekananda (12 January 1863 – 4 July 1902) was a teacher of Vedanta philosophy, and one of the most famous and influential spiritual leaders of Hinduism. A perfect life is a contradiction in terms. If I do an evil action, I must suffer for it; there is no power in this universe to stop or stay it. No one ever landed on English soil with more hatred in his heart for a race than I did for the English, and, on this platform, are present English friends who can bear witness to the fact, but the more I lived among them, saw how the machine is working, the English national life, mixed with them, found where the heart-beat of the nation was, the more I loved them. There is none among you here present, my brothers, who loves the English people more than I do. You have to see what is going on there, and you have to mix with them. As the philosophy, our national philosophy of the Vedanta, has summarised all misfortune, all misery from that one cause, ignorance, herein also we must understand that the difficulties that arise between us and the English people are mostly due to that ignorance; we do not know them, they do not know us. After so much austerity I have known that the highest truth is this: He is present in every being! These are all in manifold forms of him. There is no other God to seek for! He alone is worshipping God, who serves all beings! Mohammed spoke some wonderful truths. If you read the Koran, you find the most wonderful truths mixed with superstitions. How will you explain it? That man was inspired, no doubt, but the inspiration was as it were, stumbled upon. He was not a trained Yogi, and did not know the reason of what he was doing. Think of the good Mohammed did to the world, and think of the great evil that has been done through his fanaticism! Think of the millions massacred through his teachings, mothers bereft of their children, children made orphans, whole countries destroyed, millions upon millions of people killed! So we see this danger by studying the lives of great teachers like Mohammed and others. Yet we find, at the same time, that they were all inspired. Whenever a prophet got into the superconscious state by heightening his emotional nature, he brought away from it not only some truths, but some fanaticism also, some superstition which injured the world as much as the greatness of the teaching helped. To get any reason out of the mass of incongruity we call human life, we have to transcend our reason, but we must do it scientifically, slowly, by regular practice, and we must cast off all superstition. We must take up the study of the super-conscious state just as any other science. On reason we must have to lay our foundation, we must follow reason as far as it leads, and when reason fails reason itself will show us the way to the highest plane. When you hear a man say "I am inspired," and then talk irrationally, reject it. Why? Because these three states —instinct, reason, and super-consciousness, or the unconscious, conscious and super-conscious states—belong to one and the same mind. There are not three minds in one man, but one state of it develops into the others. Instinct develops into reason, and reason into the transcendental consciousness ; therefore not one of the states contradicts the others. Real inspiration never contradicts reason, but fulfils it. Just as you find the great prophets saying, "I come not to destroy but to fulfil," so inspiration always comes to fulfil reason, and is in harmony with it. It is here that Indians build temples for Mohammedans and Christians; nowhere else. If you go to other countries and ask Mohammedans or people of other religions to build a temple for you, see how they will help. They will instead try to break down your temple and you too, if they can. It was India's Karma, her fate, to be conquered, and in her turn, to conquer her conqueror. She has already done so with her Mohammedan victors: Educated Mohammedans are Sufis, scarcely to be distinguished from Hindus. Hindu thought has permeated their civilisation; they assumed the position of learners. And England will be conquered in her turn. Today she has the sword, but it is worse than useless in the world of ideas. You know what Schopenhauer said of Indian thought. He foretold that its influence would be as momentous in Europe, when it became well known, as the revival of Greek and Latin; culture after the Dark Ages." If all India stands up and takes all the mud that is at the bottom of the Indian Ocean and throws it up against the Western countries, it will not be doing an infinitesimal part of that which you are doing to us. He is an atheist who does not believe in himself. The old religions said that he was an atheist who did not believe in God. The new religion says that he is an atheist who does not believe in himself. The remedy for weakness is not brooding over weakness, but thinking of strength. Teach men of strength that is already within them. This world is the great gymnasium where we come to make ourselves strong. It is the coward and the fool who says, This is my fate – so says the Sanskrit proverb. But it is the strong man who stands up and says, I will make my own fate. It is people who are getting old who talk of fate. Young men generally do not come to astrology. Buddha is the only prophet who said, I do not care to know your various theories about God. What is the use of discussing all the subtle doctrines about the soul? Do good and be good. This is the gist of all worship — to be pure and to do good to others. He who sees Shiva in the poor, in the weak, and in the diseased, really worships Shiva; and if he sees Shiva only in the image, his worship is but preliminary. The prayers of those that are pure in mind and body will be answered by Shiva, and those that are impure and yet try to teach religion to others will fail in the end. It is in love that religion exists and not in ceremony, in the pure and sincere love in the heart. Unless a man is pure in body and mind, his coming into a temple and worshipping Shiva is useless. The prayers of those that are pure in mind and body will be answered by Shiva, and those that are impure and yet try to teach religion to others will fail in the end. External worship is only a symbol of internal worship; but internal worship and purity are the real things. Without them, external worship would be of no avail. Therefore you must all try to remember this. People have become so degraded in this Kali Yuga that they think they can do anything, and then they can go to a holy place, and their sins will be forgiven. If a man goes with an impure mind into a temple, he adds to the sins that he had already, and goes home a worse man than when he left it. A rich man had a garden and two gardeners. One of these gardeners was very lazy and did not work; but when the owner came to the garden, the lazy man would get up and fold his arms and say, "How beautiful is the face of my master", and dance before him. The other gardener would not talk much, but would work hard, and produce all sorts of fruits and vegetables which he would carry on his head to his master who lived a long way off. Of these two gardeners, which would be the more beloved of his master? Shiva is that master, and this world is His garden, and there are two sorts of gardeners here; the one who is lazy, hypocritical, and does nothing, only talking about Shiva's beautiful eyes and nose and other features; and the other, who is taking care of Shiva's children, all those that are poor and weak, all animals, and all His creation. Which of these would be the more beloved of Shiva? Certainly he that serves His children. He who wants to serve the father must serve the children first. He who wants to serve Shiva must serve His children — must serve all creatures in this world first. It is said in the Shâstra that those who serve the servants of God are His greatest servants. So you will bear this in mind. Let me tell you again that you must be pure and help any one who comes to you, as much as lies in your power. And this is good Karma. By the power of this, the heart becomes pure (Chitta-shuddhi), and then Shiva who is residing in every one will become manifest. He is always in the heart of every one. If there is dirt and dust on a mirror, we cannot see our image. So ignorance and wickedness are the dirt and dust that are on the mirror of our hearts. Selfishness is the chief sin, thinking of ourselves first. He who thinks, "I will eat first, I will have more money than others, and I will possess everything", he who thinks, "I will get to heaven before others I will get Mukti before others" is the selfish man. The unselfish man says, "I will be last, I do not care to go to heaven, I will even go to hell if by doing so I can help my brothers." This unselfishness is the test of religion. He who has more of this unselfishness is more spiritual and nearer to Shiva. Whether he is learned or ignorant, he is nearer to Shiva than anybody else, whether he knows it or not. And if a man is selfish, even though he has visited all the temples, seen all the places of pilgrimage, and painted himself like a leopard, he is still further off from Shiva. Education is the manifestation of perfection present already in man. Religion is the manifestation of the divinity already in man. Say, ‘This misery that I am suffering is of my own doing, and that very thing proves that it will have to be undone by me alone.’ That which I created, I can demolish; that which is created by someone else, I shall never be able to destroy. Therefore, stand up, be bold, be strong. Take the whole responsibility on your own shoulders, and know that you are the creators of your own destiny. All the strength and success you want is within ourselves. We must overcome difficulty by constant practice. We must learn that nothing can happen to us unless we make ourselves susceptible to it. There is nothing beyond God, and the sense enjoyments are simply something through which we are passing now in the hope of getting better things. The goal of mankind is knowledge. . . . Now this knowledge is inherent in man. No knowledge comes from outside: it is all inside. What we say a man "knows," should, in strict psychological language, be what he "discovers" or "unveils"; what man "learns" is really what he discovers by taking the cover off his own soul, which is a mine of infinite knowledge. The spirit is the cause of all our thoughts and body-action, and everything, but it is untouched by good or evil, pleasure or pain, heat or cold, and all the dualism of nature, although it lends its light to everything. “Face the brutes.” That is a lesson for all life — face the terrible, face it boldly. Like the monkeys, the hardships of life fall back when we cease to flee before them. Everything must be sacrificed, if necessary, for that one sentiment: universality. First get rid of the delusion “I am the body,” then only will we want real knowledge. Hold to the idea, “I am not the mind, I see that I am thinking, I am watching my mind act,” and each day the identification of yourself with thoughts and feelings will grow less, until at last you can entirely separate yourself from the mind and actually know it to be apart from yourself. If a piece of burning charcoal be placed on a man’s head, see how he struggles to throw it off. Similar will be the struggle for freedom of those who really understand that they are slaves of nature. Let us not depend upon the world for pleasure. Let us worship the spirit in spirit, standing on spirit. Let the foundation be spirit, the middle spirit, the culmination spirit. Neither seek nor avoid; take what comes. It is liberty to be affected by nothing. Do not merely endure; be unattached. No authority can save us, no beliefs. If there is a God, all can find Him. No one needs to be told it is warm; all can discover it for themselves. So it should be with God. He should be a fact in the consciousness of every person. One who leans on others cannot serve the God of Truth. Our supreme duty is to advance toward freedom—physical, mental, and spiritual—and help others to do so. Please everyone without becoming a hypocrite or a coward. Pray all the time, read all the scriptures in the world, and worship all the gods there are ...but unless you realize the Truth, there is no freedom. Soft-brained people, weak-minded, chicken-hearted, cannot find the truth. One has to be free, and as broad as the sky. Superstition is our great enemy, but bigotry is worse. Thank God for giving you this world as a moral gymnasium to help your development, but never imagine you can help the world. The idea of perfect womanhood is perfect independence. The important thing is: how much less you think of the body, of yourself as matter—as dead, dull, insentient matter; how much more you think of yourself as shining immortal being. The less passion there is, the better we work. The calmer we are, the better for us and the more the amount of work we can do. When we let loose our feelings, we waste so much energy, shatter our nerves, disturb our minds, and accomplish very little work. The power is with the silent ones, who only live and love and then withdraw their personality. They never say “me” and “mine”; they are only blessed in being instruments. There is no help for you outside of yourself; you are the creator of the universe. Like the silkworm you have built a cocoon around yourself…. Burst your own cocoon and come out as the beautiful butterfly, as the free soul. Then alone you will see Truth. There is one thing to be remembered: that the assertion — I am God — cannot be made with regard to the sense-world. There is only one sin. That is weakness.... The only saint is that soul that never weakens, faces everything, and determines to die game. There is to be found in every religion the manifestation of the struggle toward freedom. It is the groundwork of all morality, of unselfishness, which means getting rid of the idea that human beings are the same as this little body. This earth is higher than all the heavens; this is the greatest school in the universe. Those who grumble at the little thing that has fallen to their lot to do will grumble at everything. Always grumbling, they will lead a miserable life, and everything will be a failure. But those who do their duties as they go, putting their shoulders to the wheel, will see the light, and higher duties will fall to their share. To believe blindly is to degenerate the human soul. Be an atheist if you want, but do not believe in anything unquestioningly. We want to know in order to make ourselves free. That is our life: one universal cry for freedom. When we have become free, we need not go mad and throw up society and rush off to die in the forest or the cave; we shall remain where we were, only we shall understand the whole thing. Woman has suffered for eons, and that has given her infinite patience and infinite perseverance. Work on with the intrepidity of a lion but at the same time with the tenderness of a flower. Vivekananda was a soul of puissance if ever there was one, a very lion among men, but the definite work he has left behind is quite incommensurate with our impression of his creative might and energy. We perceive his influence still working gigantically, we know not well how, we know not well where, in something that is not yet formed, something leonine, grand, intuitive, upheaving that has entered the soul of India and we say, "Behold, Vivekananda still lives in the soul of his Mother and in the souls of her children." Swami Vivekananda's close associate Sister Nivedita testifies that Swamiji was a great devotee of the Buddha: 'Again and again he would return upon the note of perfect rationality in his hero. Buddha was to him not only the greatest of Aryans but also 'the one absolutely sane man' that the world had ever seen. How he had refused worship! (...) How vast had been the freedom and humility of the Blessed One! (...) He alone was able to free religion entirely from the argument of the supernatural, and yet make it as binding in its force, and as living in its appeal, as it had ever been." Sister Nivedita also relates that Swamiji's first act after taking Sannyas was to "hurry to Bodh Gaya, and sit under the great tree"; and that his last journey, too, had taken him to Bodh Gaya. Sister Nivedita, quoted from Elst, Koenraad (2002). Who is a Hindu? : Hindu revivalist views of Animism, Buddhism, Sikhism, and other offshoots of Hinduism. ISBN 978-8185990743, quoting Sister Nivedita: The Master as I Saw Him, p. 210-215. If you want to know India study Vivekananda. In him everything is positive and nothing negative. Vivekananda followed his teacher, Ramakrishna, in attributing a low value to scriptures and in upholding the supremacy of personal experience. The adequacy of scriptures is compared to the utility of a map to a traveller, before visiting a country. The map, according to Vivekananda, can create only curiosity for first-hand knowledge of the place and can communicate only a vague conception of its reality. Maps are in no way equivalent to the direct knowledge of the country, gathered by actually being there. 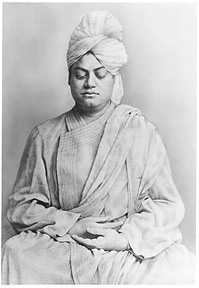 Vivekananda often asserted that only in becoming a ṛṣi does one understand the scripture properly. His argument appears to be that as products and records of direct perception, these texts were not written for the intellect, or for understanding through a process of rational inquiry and analysis. They become meaningful only when one has lifted oneself to the same heights of perception. This page was last edited on 19 April 2019, at 15:49.